Lessen bags under the eyes and reduce drooping eyelids by improving fluid metabolism. Facial Rejuvenation Acupuncture, also known as Cosmetic Acupuncture or Acupuncture Facelift, is a painless, non-surgical and safe treatment method used in fighting the ageing process. 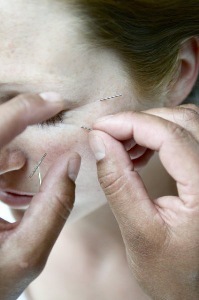 Very fine, single use acupuncture needles are inserted at individually selected acupuncture points on the face to stimulate the flow of Qi (energy) and improve blood circulation. This brings nutrients to the skin and muscles and removes metabolic toxins. Some other acupuncture points on the body may also be selected for their effect on general health and wellbeing. Once the needles are inserted you may experience a very pleasant warm tingling sensation, which is a sign that the treatment is having an effect. You will then be left to relax while the treatment works. In addition to Facial Rejuvenation Acupuncture, electro acupuncture, acupressure massage and dietary advice may be used to supplement the treatment.